B.J. Fox isn’t taking his good fortune for granted, but he’s in no mood to see the good time come to an end. Fox, a British writer and comedian, spoke to The Rafu from Tokyo about the second season of his situation comedy “Home Sweet Tokyo,” making its debut this weekend on NHK World, the Japanese national broadcaster’s global English-language network. 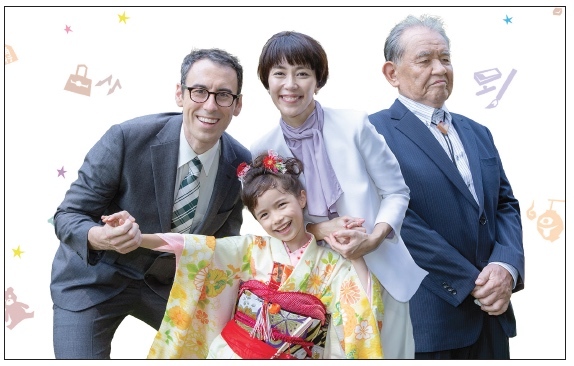 The show follows the lives of a multi-generational, multi-cultural family living in Tokyo, finding humor in the everyday twists and turns of modern Japanese life. Fox is the co-creator of the series and stars as Bryan, who has recently moved to Tokyo with his wife Itsuki (Yoshino Kimura) and their young daughter Alice (Isla Rose). A main reason for the move was to take in Itsuki’s recently widowed father, Tsuneo, played with stern distance by Tetsu Watanabe. As his wife continues her working career, Bryan finds himself a stay-at-home dad, and adjusting to the norms of life in a new land is not always a smooth process. Coming to grips with ideas such as his young child walking alone to and from school proves very difficult, leading to a rather awkward visit from the police and consternation from his wife. “Home Sweet Tokyo” is somewhat of a breakthrough for NHK, as its very first comedy primarily in English. While NHK World – available over the air in Los Angeles on Channel 28.4, as well on most cable systems – airs a wide variety of interesting programs, comedy is quite dependent on culture, and crossing that gap can be a laugh-killing barrier. “It was a brave move,” Fox said of the decision to pick up the show initially. While working for a video game company in Singapore, Fox found a love of performing stand-up comedy, enjoying the feedback from a live audience. When work took him to Tokyo in 2015, he discovered a flourishing comedy scene for foreigners there, and was eager to join the fun. Fox explained that a key goal of the show’s development was to appeal to both Japanese and non-Japanese, and still be funny. The concept was presented to director Teruyuki Yoshida, who had already delivered some Japanese-language hit comedies for NHK, including the wildly popular “Ama-chan” and “Salaryman Neo.” He, too, saw the appeal of an international fish-out-of-water story for the modern era. Fox said in addition to including all audiences in on the jokes, the show strives to touch the heart as well. “We have scripted jokes, plus the sense of physical humor Teruyuki brings,” Fox said. “We’re looking for heartwarming ends, ultimately, not simply slapstick. There are instances of conflict and misunderstanding, but in the end, we try to bring happiness. “Home Sweet Tokyo” begins its second season this weekend on NHK World TV. Check the website (www3.nhk.or.jp/nhkworld) for complete broadcast schedule.